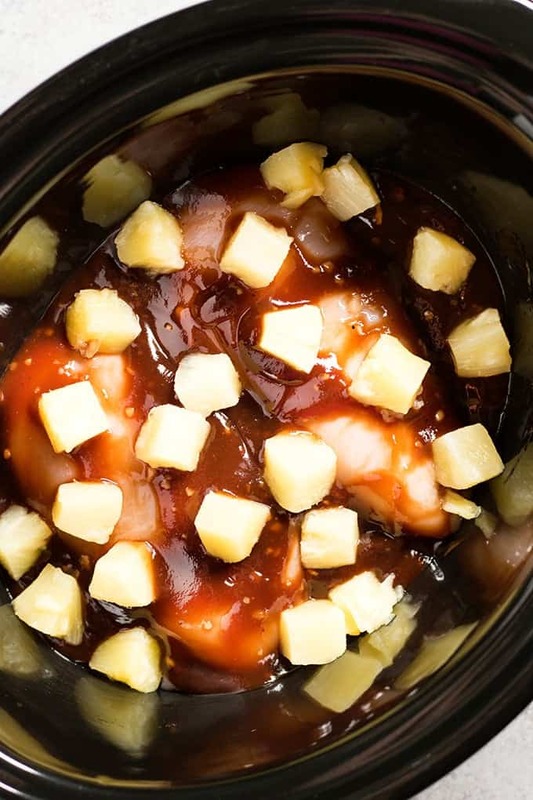 Crockpot Hawaiian BBQ Chicken – Delicious and easy to make in the crock pot, this Hawaiian BBQ Chicken combines the rich flavor of barbecue sauce with sweet pineapple! 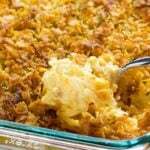 A simple, family favorite, weeknight dinner. Woohoo you GUYS we made it to Friday! Did this feel like the longest week ever for anyone else? I swear it’s the nice, warm, sunshiney, weather – literally makes me motivated to do absolutely nothing except go to the swimming pool! 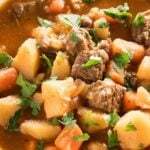 In other news – new crockpot recipe for you today! I like putting a new, really easy, slow cooker recipe out on Friday. It makes me feel like I’m helping y’all out with your dinner plans for next week. Taking some of the foot work out of it for you? So, this recipe is pretty much as easy as it sounds a looks. Only five ingredients – but man oh man it produces some amazing sweet and tangy flavor! I like to use Sweet Baby Ray’s BBQ sauce – the honey BBQ flavor, feel free to use your favorite. 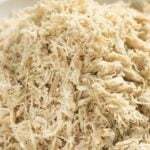 The chicken comes out tender and easy to shred and honestly this is good enough to eat by itself, but we usually make it a full meal and serve with some rice. Leftovers (if you have any) are great on mixed greens for a light lunch the next day! I’d call this “finger lickin’ good” because that’s what BBQ always makes me think of – BUT, I imagine you’re a civilized person and will eat your chicken with a fork. If not, no judgement from this girl. While I love this for it simplicity year round, it’s really a summer dinner winner for me. Those flavors of tangy barbecue sauce and sweet pineapple just scream SUMMER at me! It’s also the fact that it’s all done in the crockpot and I don’t have to be hot and miserable while whipping up some dinner for my family. 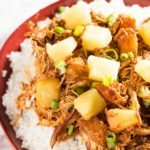 Crockpot Hawaiian BBQ Chicken - Delicious and easy to make in the crock pot, this Hawaiian BBQ Chicken combines the rich flavor of barbecue sauce with sweet pineapple! A simple, family favorite, weeknight dinner. Place the chicken breasts in the bottom of your slow cooker. Sprinkle with salt and pepper to taste. In a small bowl, whisk together the bbq sauce, soy sauce, and garlic. Pour sauce over chicken. Pour 1 can of pineapple chunks over the chicken. 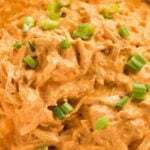 Cover the crockpot and cook the chicken on low for 6-8 hours or high for 4-6 hours. 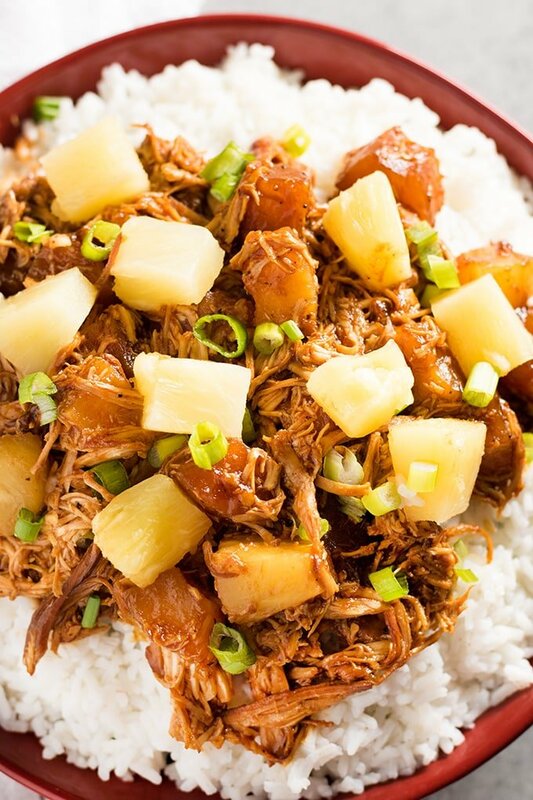 When chicken is done cooking, shred and serve over rice and topped with more pineapple and green onion if desired. 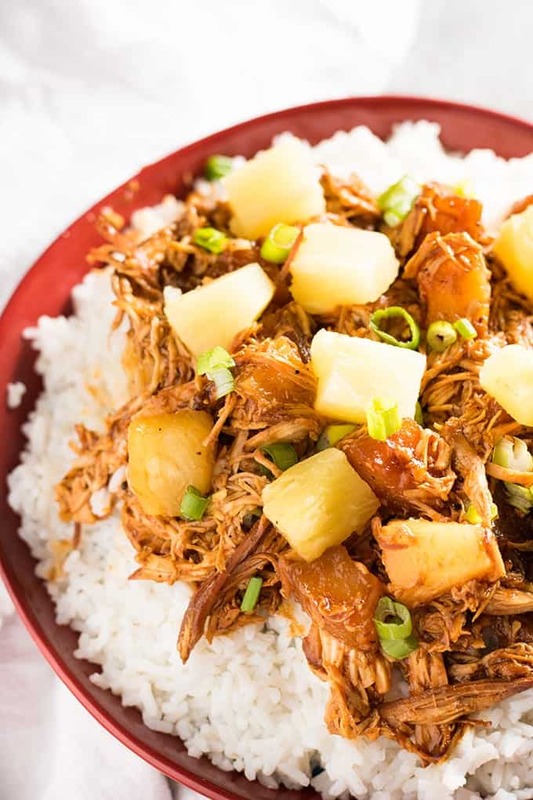 Crockpot Hawaiian BBQ Chicken: This Hawaiian pineapple BBQ chicken is a weeknight dinner made healthy and easy right in the crockpot! 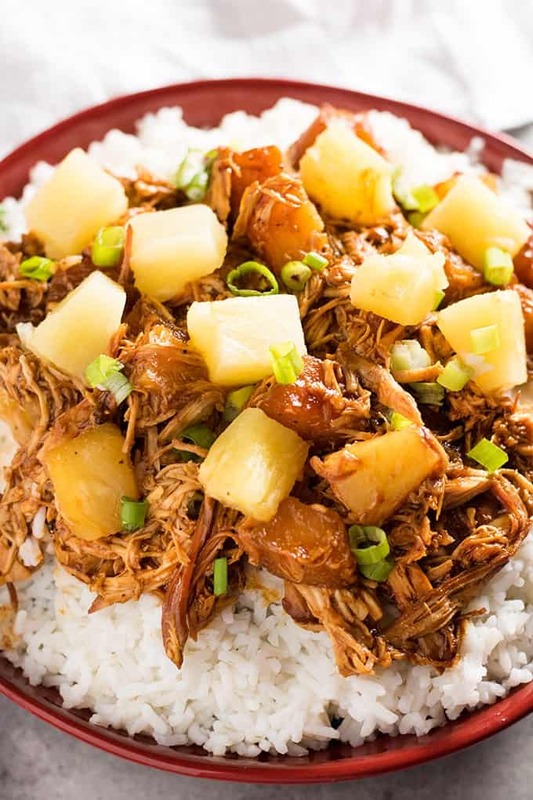 This dinner is perfect for summer with tender chicken smothered in your favorite bbq sauce and topped with sweet pineapple. 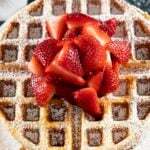 Quick and easy with only five ingredients. Can I cook in high fir 4-5 hours instead?? When you cook this, does it become watery towards the end of cooking? How much is the serving size for this? can I use fresh pineapples? I’m interested in that myself. I’d rather do this in an instant pot. Can you use left over cooked bbq chicken? If so do i just cut the time in half? I love it your recipe. Especially in my pressure cooker!! 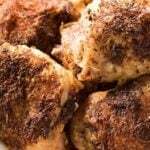 Have you tried Chicken thighs instead of breasts? Hi! This looks delicious! What size can of pineapple do you use? 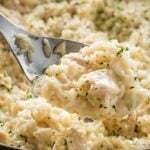 Do you use frozen chicken or fresh? Instead of pineapple can I do potatoes? I’m allergic to pineapple. Hi Veronica, you can definitely use potatoes instead! I would make sure you cut your potatoes into chunks, or baby potatoes in half. You can also ad some additional BBQ sauce if you’d like to make sure there is enough liquid. It looks like from the video above that you pour whole can of pineapple in, juice and all. I drain most of the juice from my pineapple before I pour the can in. But, the recipe works out just fine if you prefer to leave the juice as well! Hi Liz! I do drain the juice before, but it can be left in as well if you want the dish to be a little sweeter.